XML (Extensible Markup Language) is a cross-platform of web publishing formats recommended by W3C - World Wide Web Consortium. 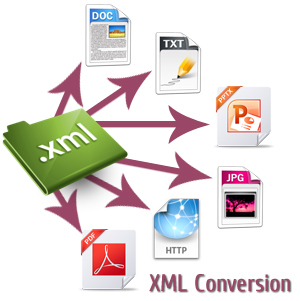 XML is a markup language useful for encoding information and services with meaningful structure and semantics which computers can instantly recognize. XML can characterize tags for all dissimilar elements and set the relationships between them. XML produce file that can then be read by many parsers, RSS feeds and can be displayed on the web in diverse layouts / formats by the use of style sheets. Global Associates has undertaken and completed a huge volume of XML coding & conversion projects from all over the world & has a broad clientele lists from USA, UK, Canada, Australia, England, Russia, Singapore, Europe and many more. Our service can be beneficial for publishers, banking, Universities, e-commerce, healthcare, Libraries, ITES, Corporations, Government Organizations, legal, marketing and research, manufacturing, publishing, real estate and Technology companies globally. Global Associates perform XML Conversion of digital content, books, magazines, journals, manuals, manuscripts, computer printouts, catalogs, news papers as well as digital formats as for instance Microfilm, Microfiche or images in jpg, tiff, gif, png, bmp, pds and other documents. Global Associates has a professional team of experienced XML coders who are well versed with latest eBook formats and can translate any flat, semi-structured data, comma separated values, delimited fields and records and so on to XML files utilizing state-of-the-art conversion techniques. While converting to XML format, the file structure, styles, layout, bulleted lists, graphics, tables, headings, links, cross-links, image files and special effects are preserved for maintaining the originality of the source document. Global Associates maintain the following procedure in XML conversion data are received from customer in hard or soft copy format. Once the data is evaluated carefully, a stringent strategy and schedule of delivery is worked upon following the specifications of the client. The project manager prepares the procedure for translating data to XML and consequently briefs the team members. Text is analyzed through the OCR/ICR technology and carefully proofread. After that XML taging and XML parsing are applied. A stringent quality control procedure with quality checks and audits are performed all through the XML conversion process to ensure 99.9% accuracy.